Magnolia trees are one of my all time favorites. They’ve always seemed special to me, serving as backdrops in some of our favorite wedding photos and we actually got married surrounded by them. I was pretty thrilled when we found this home and it had several established ones on the property. Ever since, this has become one of our Christmas decor staples. It’s quick, affordable, easy and gorgeous. We do them indoors and out because I can’t get enough of it. I promise this will be short, sweet and painless! I buy unlit because it’s more affordable and the lights never last for me in the prelit anyway, plus I like to have control over how much I add or don’t add. 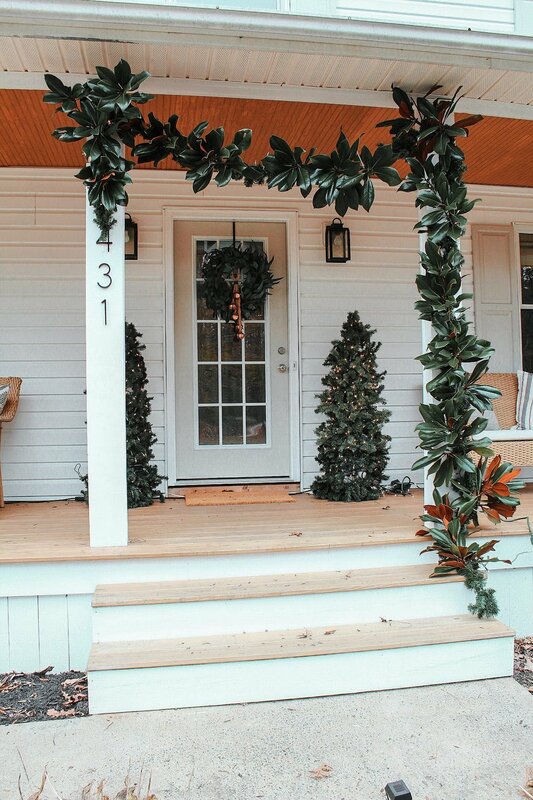 It’s easy filler since your magnolia won’t cover every bit of the garland. We bought this at hobby lobby for 50% off, it took 2 strands to make this piece so we’re at $10 so far. Wrap your garland in lights, we bought a cheap pack from target for $2.50. Life hack: clamping the garland to something stable makes it a lot easier and quicker to wrap the lights around. I thought Bobby was just being funny at first but it really was efficient. We just take clippings off the ones on our property but I’ve heard people mention places like Trader Joe’s selling it - so check your local stores / stands if you don’t have a tree! I cut around 8 chunks out for the porch garland and probably 4 for our mantle. 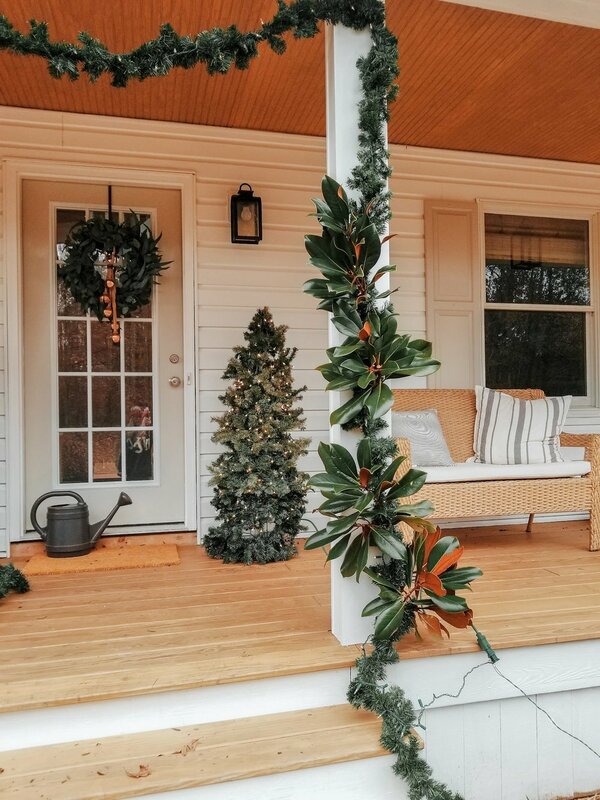 Start adding in Magnolia - I leave quite a bit of stem and lay it flush with the garland, then begin taking pieces of the garland and wrapping around the base of the stem to hold it. For the overhead portion, it gets a little heavier so we just zip tie those stems to the garland. You could zip tie the entire thing if you wanted extra security (my husband insists on this) but we’ve done it both ways and it holds just fine all season long. Also don’t forget to cut your left over zip tie off. I would say overall this took about 30 minutes and less than $15.